restaurant you are taken into what seems like a hotel foyer, and then down corridors leading into the tropical style bar area of the fabulous Bali Brasserie. 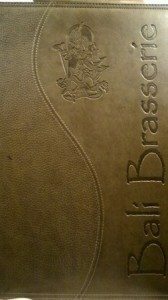 The Bali Brasserie has been open for now well over 20 years, and is run by Malaysian born TC (Tanjit Calais), and his wife who was born in Indonesia’s capital, Jakarta, hence the menu being influenced by both Malaysian and Indonesian foods. As soon as you walk in you are welcomed by the friendly staff at the bar, we were asked if we wanted to rest at the bar with a drink and a menu before heading into the restaurant to sit down. The bar was lined with comfy sloped bar rests, to perch your elbows on while looking over the menu and enjoying your drink. The bar area is comfortable, with good lighting, and well maintained, characteristic decor. We both ordered a glass of Chenin Blanc, which was light and refreshing, with notes of peaches and tropical fruits. Our lovely waiter Jasper shortly showed us through to the restaurant, which had the same Malay, Indonesian theme throughout, but dressed up with white table cloths, and candlelit lamps on each table. When notified that I was gluten intolerant, Jasper kindly went through the menu for us explaining which dishes were suitable and which were not. As he explained, most of the menu is prepared fresh, so can be made without soya sauce to ensure it is gluten free. The Mee Goreng (fried noodles) can be be made with thin rice vermicelli, (bi hun) instead of the usual egg wheat noodles. My partner and I actually met in Indonesia, and are both very familiar with the delicious cuisine, so were very excited about the menu we were about to devour. We also spent a lot of time in Malaysia, and this being our favourite country, there were a number of dishes on the menu that we were looking forward to the most, it was going to be a hard choice! As it was surprisingly our first time here (and definitely not going to be the last) we decided to go for our favourite classics to see how they compare. To start with, we ordered some homemade giant Javanese prawn crackers to share, and also some chicken satay and some marinated king prawns. 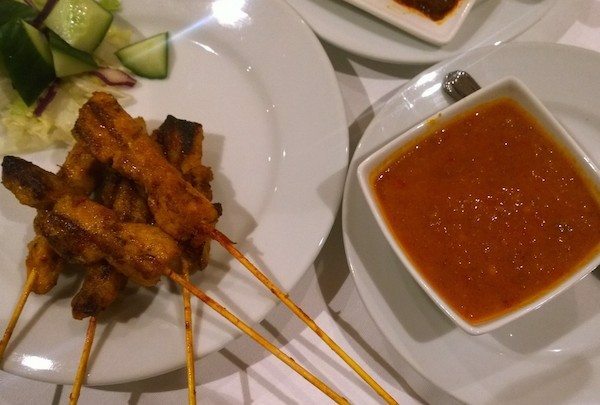 They make two different satay sauces, one with soy sauce, and the other without, for the gluten intolerants among us. We noticed the restaurant start to get a little busier, and they were laying a buffet of dishes out on a long table which seemed to start at around 8pm. They have a traditional set menu called an Indonesian Rice Table, (Rijjstafel) which consists of a starter of soup, then satay, a choice of 9 different dishes from the buffet, then finishing with the dessert of the day, all for only £17.95! Jasper explained to us the dishes that could be adjusted to be gluten free which was really helpful. 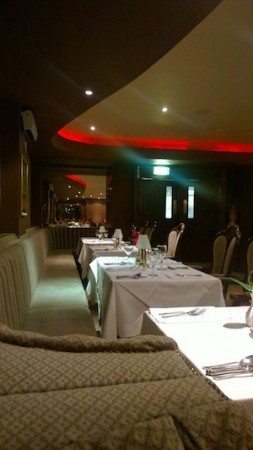 They also have a special deal for an all you can eat buffet selection for just £12.95, but you have to print off the voucher off the website. 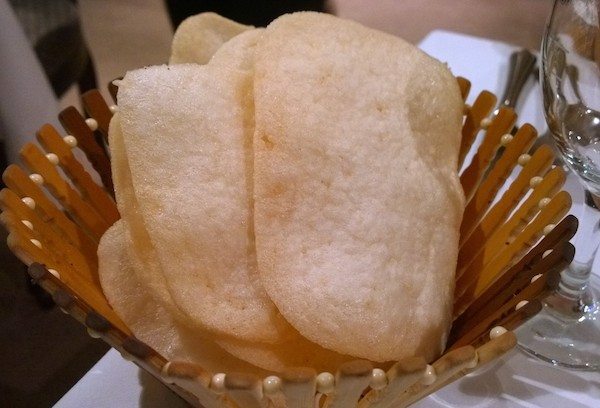 Our Javanese prawn crackers arrived almost straight away, and they were extra large and crunchy, and the sweet chilli sauce on the side was rich and flavoursome with tasty garlic flavours. 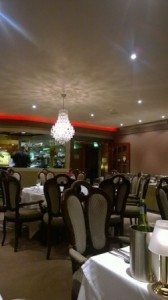 We were really enjoying the atmosphere, it was formal, but felt so welcoming and comfortable and the staff were friendly but not too obtrusive either. They provided us with a side of Sambal Blachan as well, this is common throughout Indonesia and Malaysia and is a shrimp paste cooked with chillis. It is definitely not for the faint hearted, but a touch of it in your food adds a wonderful depth of flavour, and a nice amount of spice. 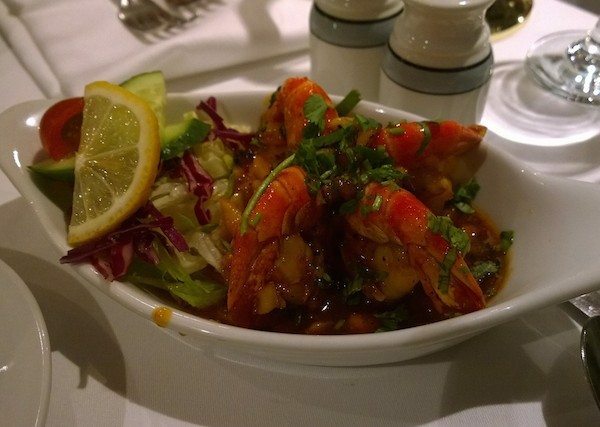 Despite the pace of the restaurant picking up, our starters came out quickly, and they smelled and looked amazing. 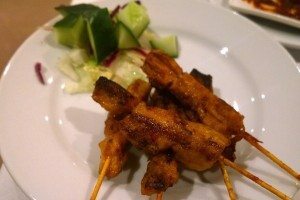 The satay had the mouth watering familiar smell of spices and the smokey grill, and the king prawns looked juicy and were smothered in a rich sauce that had wonderful aromas. The satay sauce was so fresh tasting, not over oily like most Thai restaurants over here make it. It had fresh tomato, peanut and a slight chilli kick, and came together well with the smokey grilled chicken skewers. The Bali king prawns showed off a mixture of exciting spices, including a touch of cinnamon and lots of turmeric which I really enjoyed. They were plump and juicy, and I would definitely be coming back to order them again! No sooner had we finished our starters, our plates were whisked away and we were given a stand that included tea light candles in it for our plates to sit on. We ordered three dishes between us which all were gluten free. 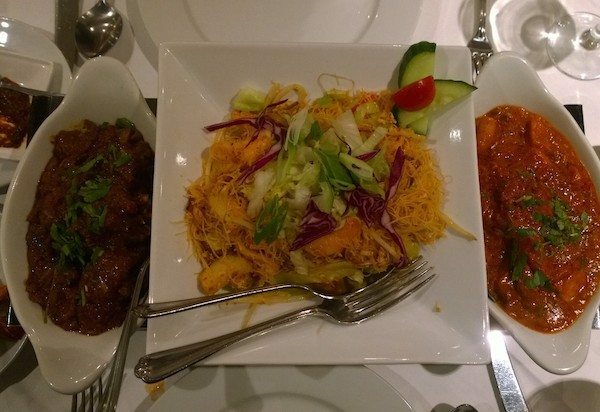 I ordered one of my favourite all time Malaysian dishes ever – the beef rendang. It is made by slow cooking beef in a mixture of rich spices including cardomom, cinnamon, chilli, turmeric, and coconut milk, plus many more. The sauce is simmered until so thick it coats the beef, and the beef is so tender that it just falls apart. Are you hungry yet? It’s so delicious. My boyfriend ordered the traditional Malaysian chicken curry, Kari Ayam, and we also ordered a plate of Mee Goreng made with the thin rice noodles to share. The food was really good, and made us reminisce on our Malaysia and Indonesia holidays. I used to always get beef rendang from the Nasi Campur stalls, and we found a noodle man on the island of Penang who used to open at 4pm everyday for 2 hours just selling mee goreng and nasi goreng but it was amazing! It really had the authentic smell and flavours that we have been missing for so long. The beef was tender, and the sauce was so rich, it really is making my mouth water just thinking about it! The chicken curry was lovely and fresh tasting, and the mee goreng was filled with vegetables, fish cake, chicken and prawns, it was all so good we didn’t want it to end. Sadly, all good things do have to come to an end, and we were rather full and feeling quite merry from all of the delicious food and wine. The dessert menu was offered, and I had to say yes, only because they did banana flambe with coconut ice cream and it was impossible to resist. Once again, despite the busier restaurant, our dessert came out quickly, and it was within minutes we were tucking in. 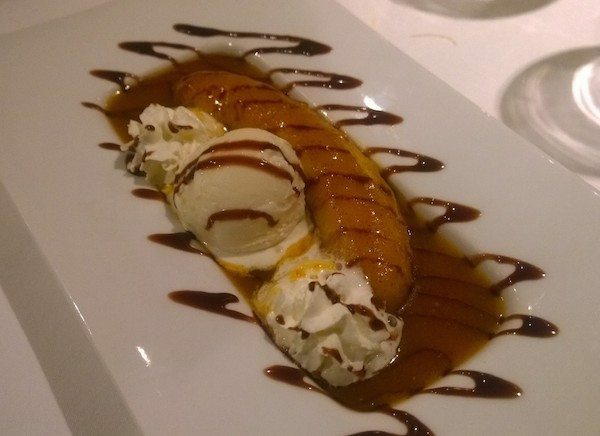 The banana is flambed in liquers and butter, and is served with a caramel sauce and fresh coconut icecream. It’s super decadent, and I am glad that we had one to share. They also serve a range of sorbets, and there is an icecream sundae on the menu that I bet would imagine it would be pretty impressive. and a little sleepy then I probably would’ve stayed! What a lovely place to spend a Wednesday evening, and I will most definitely be visiting again shortly with some friends. 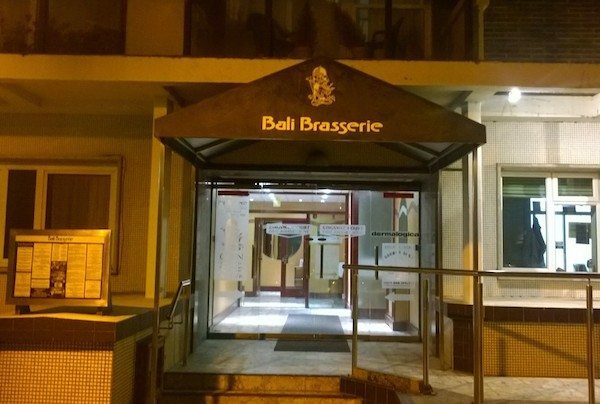 The Bali Brasserie welcomes you like a home away from home, and if you are after authentic, Malaysian, and Indonesian dishes, then this is a Brighton restaurant that you don’t want to miss. The menu is fantastic for anyone who has to eat gluten free, and is well aware of other dietary requirements with plenty of vegetarian options as well.